In the morning I posted about the Cobra equation and included some graphs using past data. The graphs showed how capital utilization and employment of labor would increase up to the profit maximization line and then fall back into a recession. But I did not include a graph for the years before the 2001 recession, because it is a special case. So I present it now. The red dots are from the 3rd quarter for each year, from 1992 to 2001. The recession started in 2001. The coefficient a is 0.6652. (see below for equation.) The effective labor share was 80%. The effective demand limit line shows (capital utilization * employment = 80%) The red line is the measure of profitability. (See equation below) As the numbers in the graph increase, profitability increases. 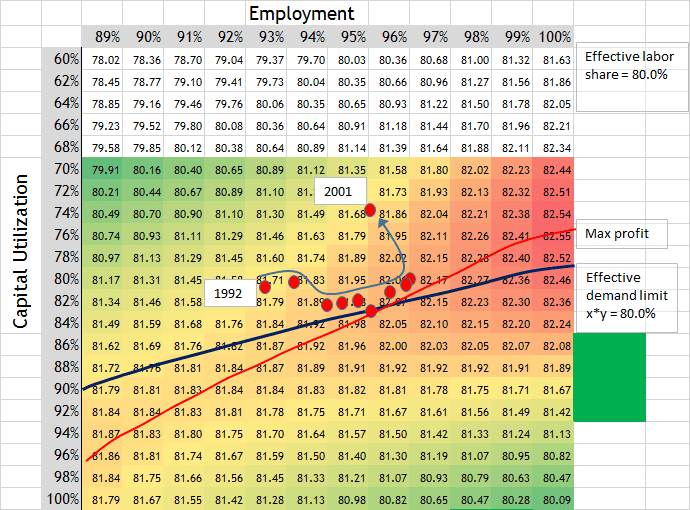 The red line shows the maximum profitability for each employment rate. This time period shows more clearly than other time periods how the economy moves up the lines of effective demand and profit maximization. The match is uncanny. The red dots move almost perfectly along the slopes of the two lines. In other examples given in the morning’s post, the economy didn’t move much along the lines before a recession. But in this example, we see 7 years of data where the economy moved along the two lines. The graph seems to explain very well what is going on. I would have expected more inflation as the economy moved up along the profit maximization line after 1997. There wasn’t much inflation. Yet, there was inflation in the dot.com bubble. The inflation apparently was transferred to that bubble. Yet it is important to see how capital utilization decreased as employment increased through those years. One might expect capital to be utilized more as more people are employed. But this cobra equation shows that as more labor is employed on the profit maximization line, less capital will be utilized. We have 7 years of data here showing this. Is this a breakthrough in understanding? MFP = marginal factor productivity (assumed $50 in graph). a = coefficient for labor share to establish effective demand limit on capacity utilization. Coefficient a = 0.88*s^2 – 2.31*s + 1.95 … (s = effective labor share, for example 80% as 0.80). Keep in mind… the key to making this equation work is to have a factor that determines the coefficient a correctly. Labor share is the factor that shifts this equation appropriately with the data. Is the decline in Capital/Capacity Utilization itself an indicator of growth of an asset bubble? I’m trying to figure out potential sources of the decline in the ratio. Production isn’t down, so it’s an increase in capital stock. Is that restricted to actual productive assets (tools?) or can it also be related to accumulation of profits? You are asking the perfect questions. The decline in capital utilization to extend profits needs to be researched. It may be like a monopoly situation where a restriction in production leads to higher profits. When this is done in the aggregate, it starts to trigger inflation. I conjecture that businesses calculate an increase in profits if they hold their level of production constant and let the market demand increase their sales. It is sort of a passive monopolistic effect. It is only a thought at the moment. But it is true, production does not decrease, in the sense that real GDP does not decrease. It keeps growing most likely as a result of higher employment. But would you explain your thought about accumulation of profits? Perhaps you are trying to model a system that no longer exists, using US domestic capacity utilization even in 1992. An R2 of 0.662 is not a robust fit to begin with. During the period of your data set, perhaps, the model changed to a domestic deflation created by loss of jobs as a result of production in the 3rd world. The 0.662 is for the coefficient “a” in the equation. That coefficient will change as labor share changes. Sorry, been busy. I meant, are we talking about accounting capital (equity/debt corresponding to total assets including cash and held for sale securities) or are we talking about productive capital (equipment, facilities, contracts). If it is accounting capital, there can be a lot of “capital” accumulating that is not used for production. In fact this is the case currently. Companies like Microsoft have massive caches of money sitting around the world that they have limited investment opportunities for, so they use it for things like buying Nokia.